An ecological community is a collection of organisms occurring together in a location and interacting to varying degrees. A community is often defined by the most common or prominent species found in it (a beech-maple forest) or by its environment (a wetland community). Community ecologists study what determines membership in communities and how and why communities change in space and time. One of the most important characteristics of an ecological community is species diversity. Species diversity is a measure that combines the number of species in a community with the relative abundances of those species. Understanding why some species are more abundant than others is particularly important because communities that are strongly dominated by one or a few species often have low species diversity overall. Differences in species diversity among communities occur because of differences in environment, differences in the kinds and strengths of species interactions, or both. There are many kinds of species interactions in communities, all of which affect species diversity. Predation, parasitism, and herbivory are interactions in which one species benefits at the expense of another. Competition involves a mutually negative interaction among species. Mutualism involves an interaction in which both species derive benefit. Some of these interactions may lower diversity, while others increase diversity. In addition, the strengths of these interactions change as the environment changes. For example, competition may be more intense when resources are severely limited. In streams, for instance, different species of fish compete for insect prey. When prey are scarce, competition among fish species is strong, and when prey are abundant, competition is weak. 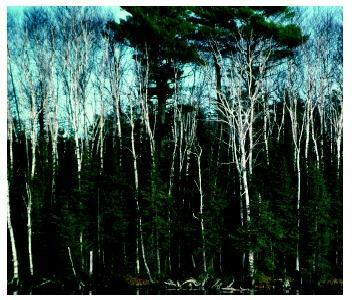 A second-growth birch forest with an evergreen understory in northern Wisconsin. One of the most important characteristics of an ecological community is species diversity. Ecological communities are complex because many different factors affect species interactions in communities. Moreover, the different types of interactions among species in communities interact. For example, high predation rates can reduce competition among prey species. Because of this complexity, ecologists are keenly interested in understanding the complex web of interactions among the various plants, herbivores, carnivores, and decomposers in a community. In fact, one of the challenging questions in community ecology is whether the web of interactions in a community is controlled primarily by resources or by top predators. Human activities are changing the abundance of resources in the environment, which in turn changes the types and strengths of interactions among species in communities. Ultimately, these changes could alter species interactions and patterns of species diversity. Ecological communities are dynamic. An ecological community may change as a result of species interactions, but other phenomena, such as dispersal or the movement of an individual from one place to another, also cause communities to change. Dispersal is important because it means that a community in one area can influence community composition some place far away. In the Caribbean, for example, the composition and abundance of lizards on islands change suddenly and dramatically following hurricanes. Flooding during hurricanes kills animals on some islands while some animals float from one island to another during and after the storm. Hurricanes are an example of ecological disturbance, an event that destroys living organisms and frees space for new individuals to colonize. Disturbances—including fires, floods, and volcanoes—are natural occurrences, and they are one of the primary forces that create change in ecological communities. The study of how disturbances affect communities is an important aspect of community ecology. Many disturbances, like forest fires, may appear harmful or destructive, but they are natural phenomena that initiate change. Succession is the change in species composition at a site over time. Primary succession occurs in previously unoccupied habitats, such as the lava produced by a volcano. Secondary succession, which is much more common, occurs following a disturbance in an area that was previously occupied by a community. Successional change occurs as species disperse to a newly disturbed site and interact over time. Eventually, the rate of community change during succession decreases. Stability is a measure of a community's ability to return to a condition that existed before disturbance. The question "Does diversity increase stability?" is hotly debated by ecologists. Some think that diversity increases stability because when many different species occupy an area, they use the resources more fully. In doing so, the diverse community is resilient because when the abundance of one species declines, for example during a drought, the abundance of a more drought-tolerant species increases. Other ecologists think there is little relationship between diversity and stability. Rather, they believe that any response is really a function of the dominant species in the community. This issue is not likely to be resolved for some time. Ecological communities are complex assemblages of organisms that undergo a rich array of interactions. These interactions affect the kinds and abundances of species found in a community. Understanding how species coexist and why communities change over time are exciting and challenging questions in ecology. Knowledge about community ecology becomes increasingly valuable as human activity alters the global environment. Thus, as the human population increases, ecologists will provide key information needed to help manage and conserve species diversity and ecological communities. Molles, Manual C., Jr. Ecology: Concepts and Applications. Boston: McGraw-Hill, 2000. Shahid Naeem, et al. "Biodiversity and Ecosystem Functioning: Maintaining Natural Life Support Processes." Issues in Ecology, no. 4. Washington, DC: Ecological Society of America. American plant ecologist who defined early-twentieth-century ecology by introducing the concept of climax communities. In the 1910s, before many paved roads existed, Clements and his wife drove across the American West describing and photographing every major ecosystem in North America.